Canon USA has introduced five portable projectors, all of which use the company’s DLP BrilliantColor display technology to deliver 3,000 lumens of brightness and a 2,300:1 contrast ratio. The filter-free projectors can have up to 6,000 hours of lamp life when in Economy mode, which reduces power consumption by approximately 20 percent. The LV-WX300 Multimedia Projector and LV-WX300ST Short Throw Multimedia Projector (pictured) have native resolution of 1,280 x 800, while the LV-X300 Multimedia Projector and LV-X300ST Short Throw Multimedia Projector offer 1,024 x 768. The LV-S300 Multimedia Projector has native resolution of 800 x 600. All five of Canon’s new portable projectors include screen color adjustment, which helps to correct the colors of the projected image in relation to the color of the projection surface. Five pre-set colors include light yellow, pink, light green, blue and blackboard. The projectors also feature five image modes: presentation, standard, sRGB, movie and two user-determined custom settings. The projectors are also 3D-ready when combined with an optional DLP-Link System and other accessories. The LV-WX300ST and LV-X300ST short-throw models feature projection ratios of 0.49:1 and 0.61:1 respectively, enabling them to project a picture that measures 80 inches diagonally from a distance of 33 and 39 inches, respectively. All five new projectors, which range in price from $399 to $799, weigh approximately six pounds and are backed by Canon’s three-year parts and labor limited warranty and Projector Protection Program. 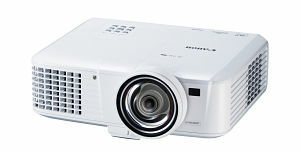 For more information about these new projectors, click here.